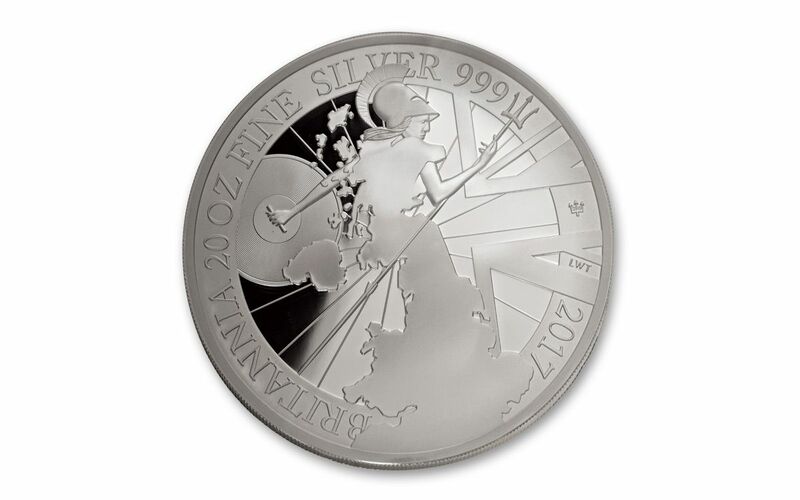 First struck in 1997, the Silver Britannia is Great Britain’s premier silver coin, similar to the China Panda, Canada’s Maple Leaf or the American Eagle Silver Dollar. To celebrate the 20th anniversary of this major world coin, The Royal Mint celebrated with a number of special proof releases to add to the Britannia collection. Possibly the greatest of them all was this first-ever, one-year-only 20-Ounce Silver Britannia Proof! 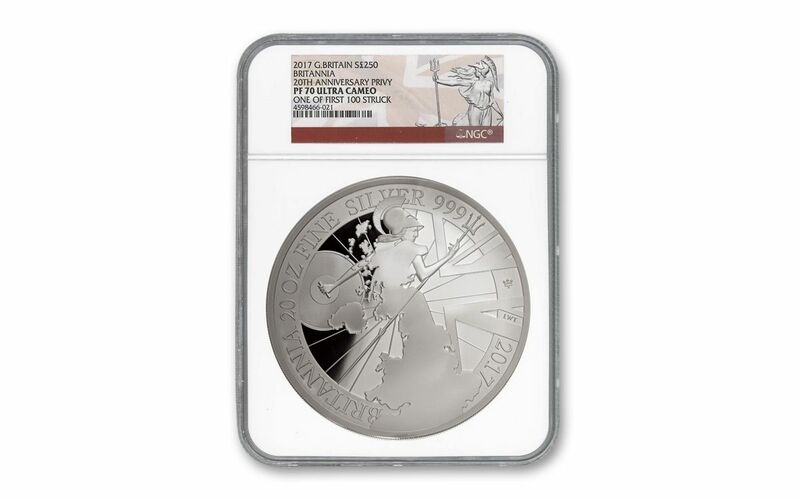 This massive 100mm proof features the latest in a long line of beautiful, one-year-only designs -- a helmeted Britannia taking hold of spear and shield, her robe taking the shape of Great Britain itself! This is a one-year issue, one-year design and The Royal Mint is only doing this once, so grab this proof while you can! 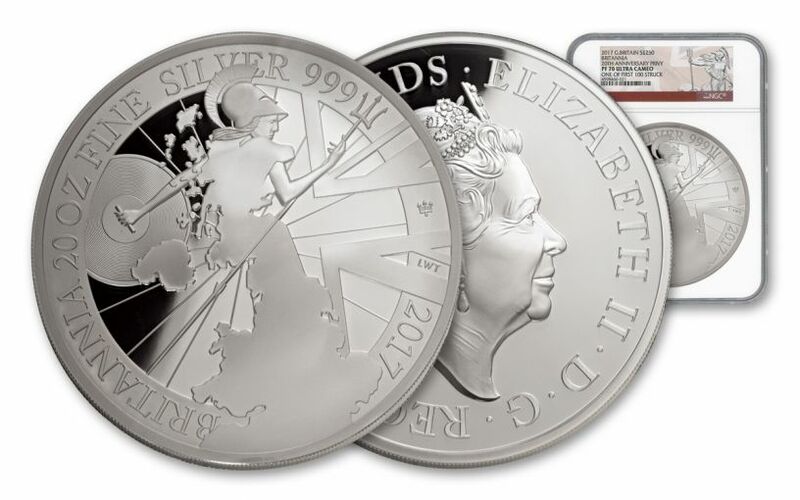 20 OUNCES FOR A 20TH SILVER ANNIVERSARY -- First struck in 1997, we're celebrating the first-ever Silver Britannia with our first-ever 20-ounce silver Britannia coin! Struck 99.9% pure silver, this coin will easily become the crown jewel of your Silver Britannia or world silver collection in its massive 100mm size! MODERN DESIGN -- This stunning vision from Louis Tamlyn, a student at Central Saint Martins in London, is rich with symbolism. It depicts Britannia in the form of the British Isles, crowned with her Corinthian helmet, shield and trident in her hands, over a field of radial lines that evoke the Union Jack. The obverse features Queen Elizabeth II by Jody Clark, the same designer of the 2014 Britannia design. AN ANNIVERSARY TRIDENT MINT MARK -- To mark the series' 20th anniversary, each 2017 Silver Britannia Proof features a special one-year-only anniversary trident fork mint mark. PROOF-STRUCK IN PURE SILVER -- The artisans at the Royal Mint use hand-selected planchets, polished dies and multiple strikes to create gorgeous 20-ounce, 99.9% pure silver pieces of numismatic art. These proofs are struck multiple times with specially prepared dies that create details so crisp and fields so mirrored you’ll have trouble looking away--especially since this release has been struck with a massive 100 mm diameter! 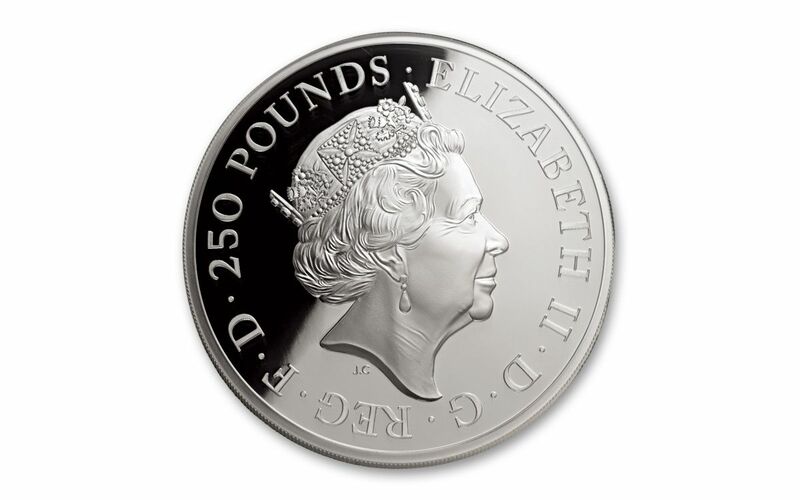 UNITED KINGDOM LEGAL TENDER -- Each Silver Britannia Proof is 250 pounds sterling United Kingdom legal tender -- a fact you'll find minted on the coin's obverse along with Jody Clark's profile of Her Majesty Queen Elizabeth II. CERTIFIED FLAWLESS -- Your 2017 20-Ounce Silver Britannia Proof will come certified Proof-70 Ultra Cameo (PF70 UC) by Numismatic Guaranty Corporation (NGC), a distinction that means your perfectly graded proof will have ZERO imperfections -- showing all features and fields exactly as the engraver and mint intended. In addition, your proof will be certified as One of First 100 Struck by NGC. Finally, your proof will also be sonically sealed in an acrylic case with a special Britannia label, giving you the best in protection while granting clear sightlines into every beautiful detail. LIMITED-MINTAGE, ONE YEAR ONLY DESIGN -- Limited to a production run of 350 coins, this is the first time The Royal Mint has struck any coin in a 20-ounce silver and they're only going to do it once. Once they're gone, they're gone for good! Grab your chance at owning this magnificent proof's one-year-only design and issue today, as it may be your only opportunity. This 2017 20-Ounce Silver Britannia Proof both establishes and reimagines an enduring symbol of British strength -- in a whole lotta silver! Whether you're new to the Britannia series or a longtime collector, this one's worth getting and keeping. Grab your chance at owning this magnificent proof's one-year-only design and issue today!